A curious anthropological phenomenon is popping up all over the world. 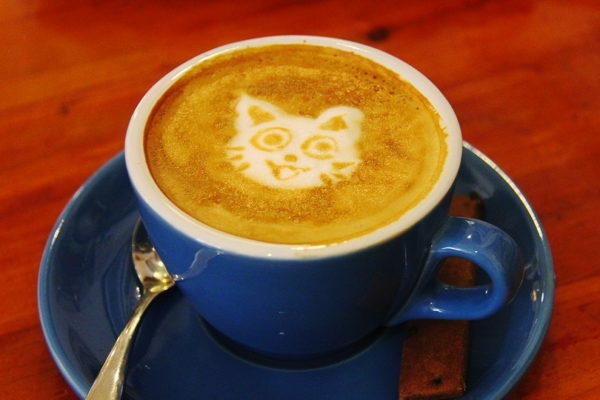 Humans are traveling far and wide to drink coffee surrounded by cats. It’s not just teenage girls in Tokyo anymore. Cat lovers from all walks of life are flocking to cat cafés worldwide in hopes of catching a glimpse of this most rare of species – the four-legged feline. I recently returned from Paris, where I visited Le Café des Chats in Paris’ 3rd arrondissement with my teenage daughter. A café full of crazy cat ladies you might ask? In fact, there were plenty of well-heeled women, young and old, and several seemingly well adjusted men in attendance. We were told the rules before being seated: don’t touch a sleeping cat, no feeding the cats, no picking them up and no flash photography. We were required to disinfect our hands before entering (there was no such rule on departure). There were a dozen cats domiciled in the café, eleven of which were asleep. You would think that no one had ever seen a cat before. The anticipation of one of them waking from their catnap in order to be petted was palpable. My fellow diners (a full brunch was on offer this particular day) watched in rapt attention for any sign of movement, phone cameras at the ready to capture this once-in-a-lifetime experience. Alas, the only signs of life we observed were cats stretching into new sleeping positions. Our time there eventually ran out so, regrettably, we would have to wait until we got home to pet our own cat. Cat cafés gained in popularity almost a decade ago in Taiwan and the cat craze quickly spread to Japan. In both cases, living in small spaces meant many people were unable to have pets at home so they sought out feline companionship at cat cafés, which serve a dual purpose of facilitating pet adoptions. As the novelty of this new kind of petting zoo took hold, throngs of tourists descended. Tourists = money = trendy, so the already stellar cat experience rose quickly to the penultimate level: hipstertopia. There are now over 300 cat cafés worldwide, with 24 in the US at last count: the Meow Parlour in New York, KitTea in San Francisco, Crumbs and Whiskers in Washington DC and the Cat Town Café in Oakland, CA, to name just a few. Regular contact with cats has been proven to lower blood pressure, improve morale and even reduce the risk of heart attack in humans. If you are the rare unfortunate who does not have a cat at home, you may now rest easy in the knowledge that you are never far from a cat café.